Please join us for M.I.A.’s first show at Baker Street DTC. It will be a Coalition of Cover Bands playing from 3PM till 7PM and no cover charge. 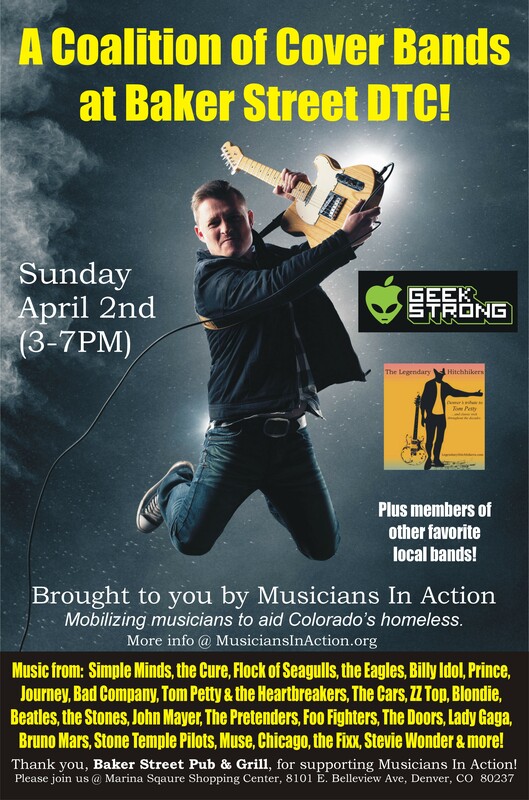 Music is compliments of Geek Strong, the Legendary Hitchhikers and personnel from more of your favorite local bands. Baker Street Pub & Grill is located at Marina Square Shopping Center, 8101 E. Belleview Ave, Denver. M.I.A. will also have CDs and T-shirts available, plus some special raffle prizes. Please join us! This is the very first of many shows Musicians In Action-CO is conducting to raise funds for our new Supported Employment Program. M.I.A. will be connecting those experiencing homelessness with long-term employment opportunities and job skills training. Please stay tuned and thank you for supporting Musicians In Action!